I’m trying to catch up on all of my recent recipes and figured a 2-recipe breakfast post would be a nice little bonus on this dreary day. Apparently Vancouver is in the midst of a wind and rain storm, charmingly called a “pineapple express”. Such a sweet name for something so foul. There’s nothing but grey clouds, darkness and enough rain to make me worry about our roof caving in. So what better way to spend the morning but baking muffins. I originally got this recipe off of Baking Sheet, but I made a few changes to the recipe. Although they do contain maple syrup as the sweetener, I didn’t find them very maple-y tasting. They are still very delicious and very light in texture, even with the whole wheat flour. 1. Preheat the oven to 375F and lightly grease a 12-cup muffin tin. In a large bowl, whisk together milk, yogurt, egg and maple syrup. 2. In a medium bowl, stir together flours, baking soda, and spices. Pour the dry ingredients into wet ingredients and blend gently. Add in the cranberries and nuts/seeds. 3. 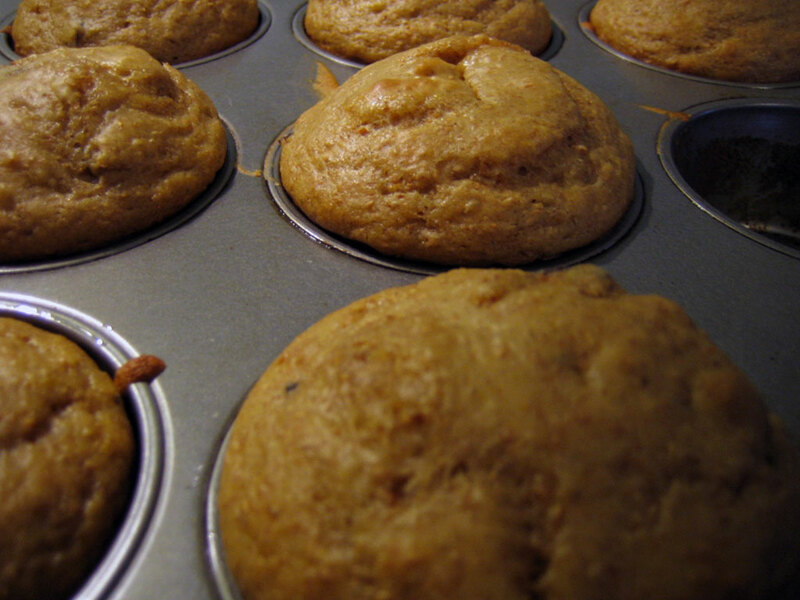 Pour batter into muffin tins and bake for 15 – 18 minutes until muffins springs back lightly when touched. Carefully remove from tin and cool on a wire rack. I’m not sure why it looks like this plate of crepes is sticking out its tongue at me but it got eaten up anyway! The next recipe I tried was again from my “hmmm, what am I going to make” blog favorite, Baking Sheet. During my last year of university, my roomate at the time used to make crepes as a weekend breakfast treat. She filled them with raspberry jam and cottage cheese, rolled them into cigar shapes, packed them into a baking pan and then covered the whole thing with coffee cream and baked them in the oven until they got all warm and creamy. It was a delicious breakfast treat that I made a few times but somehow I managed to forget all about them. Lately, tho, crepes seem to be popping up all over my radar. There are several crepe places downtown that serve up nutella filled crepes and other sweet concoctions. I’ve always been able to resist their lure because, hey, it’s just a rolled up pancake…what’s the big deal? But then the other week, I stumbled onto Thimble’s post about her portabello & asparagus crepes and I had to do a double take. Although I still haven’t gotten around to making a savory dinner crepe yet, this past weekend I did take the crepe plunge and came up with these beauties. They were “scrumptious” (Cornelius’ word for them) and kinda fancy which elevated our Sunday breakfast to extraordinary without much of an effort. 1. Place flour in a large bowl, add milk and water gradually, whisking until the mixture is smooth. Beat in eggs, salt, vegetable oil and vanilla extract. Make sure batter is very smooth, then set aside to rest for at least 20 minutes. 2. In a small skillet, melt butter for the filling. Add apples and saute for a couple of minutes over medium heat. Add rum and cherry jam and stir about until the sauce thickens somewhat. Turn off heat and set aside. 3. Heat a 10-inch skillet over medium-high heat. Lightly grease and pour batter onto the skillet, about 1/4 cup. Pick up the skillet and swirl the batter around until it even coats the entire bottom of the pan. Cook until the edges come away from the pan and the top of the crepe looks almost dry, about 3 minutes. Turn and cook the other side for about a minute. 4. 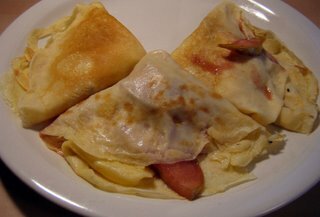 Fill crepe with filling, roll or fold, and serve immediately. Makes about ten 10-inch crepes. Gee, I can’t remember the last time I had crepes. It must have been over 10 years ago when I was in Greece. I had a cheese and mushroom filling. I wasn’t all that impressed with the crepe I was eating. I found that it didn’t have enough substance. I could have easily consumed 4 before feeling satiated. I have also tried cherry blintzes which I guess are similar to crepes. Or maybe not. I don’t want to offend any diehard crepe fans out there. But hey, cheese’s debut is coming up on Sunday and I just picked up a honkin’ slab of cheddar to celebrate. Woo-hoo! it´s raining so much here, and the worst is, we have to pretend to be really cheerful because there was a drought. muffins would make it better, good idea. Ooh yet another recipe to try in my attempt to conquer the crepe! Your crepes are so beautiful!Do you have any tips for making them turn out paper thin and golden? Mine tend to be……hearty! I love crepes but I takes me ruining the first 5 to get the hang of it again because it’s always so long since the last time I’ve made them. joanne, sometimes you just gotta have 4 crepes! lobstersquad, i feel for you about the rain. but luckily, here in vancouver, we can join everyone in complaining about the weather. eviedee, this was my 1st attempt after many years and they turned out so perfect…and belive me, i was nervous they’d be bad. i don’t know if i had the crepe knack or what, but give them a try & let me know how it goes!